Raymond Carver was celebrated as one of America’s best short story writers before his death from lung cancer at the age of 50 in August 1988. He was also an accomplished poet who published eight volumes of poetry in his lifetime. During the last five years of his post-alcoholic career, he oversaw publication of three major collections — Fires (1983), Where Water Comes Together with Other Water (1985) and Ultramarine (1986). A fourth collection, New Path to the Waterfall, was completed in the last weeks of his life and was published posthumously in 1989. His more than 300 poems, including a handful of unpublished ones, are collected in All of Us, published by Random House/Vintage Books in 1996. Born in Oregon on the banks of the Columbia River and raised in Washington State, Carver spent much of his life on or around the steelhead and salmon waters of the American West Coast. He was an avid outdoorsman — hunter and fisherman, including fly angler. He often hunted and fished with other notable writers/close friends including Richard Ford. Water or fish form part of the titles of the majority of his poetry collections. In his lyrical poetry Carver eschews the deliberate opaqueness and metaphorical obscurity that defines post-Pound and post-Eliot modern poetry. His spare, direct and descriptive anecdotal poetry follows a tradition represented by Wilfrid Owen and such Edwardian pastoralists as Edward Thomas. Carver’s poetry about rivers, fish and angling links him to English poet Ted Hughes. England’s former poet laureate not only shared the American writer’s passion for fly fishing, he established a strong affinity with the salmon and steelhead waters of the West Coast — in Hughes’ case it was British Columbia — which he gave expression to through powerful poetry including, but not limited to, the volume River. Like Coleridge’s Conversational Poems, Carver’s verse is the poetry of conversation, intimate and personal, with a sense of the extraordinary underlying and informing the everyday and commonplace. His poems about fish and fishing are about more than angling; they reveal multiple dimensions of life, with intimations of mortality and death, rebirth and redemption. Carver’s blue-collar poetic voice is clear and concise. Carver uses the relationship between angler and prey (fish) or angler and water as a symbol of deeper relationship: between past and present, human (family/society) and non-human (nature), seen and unseen, father and son, husband and spouse. Carver is a keen and attentive observer of nature. In this regard he reminds me of Wendell Berry and Mary Oliver, not to mention fellow West Coast poets Robinson Jeffers, Theodore Roethke and Gary Snyder. The natural world is both character and mood-setter, the atmospheric background to the poet’s thoughts, anxieties and momentary joys. At bottom Carver is a meditative poet; his poems are sombre reflections framed by the world of nature. I cannot read Carver’s poems about rivers, fish and angling without thinking of that visionary poet William Blake and his assertions that you can see a world in a grain of sand and hold infinity in the palm of your hand; that nature without man is barren; or that everything that lives is holy. Nature was a sacred place for Carver, a refuge and a solace, a source of reflection and contemplation that placed him knee deep in the current of angling tradition extending back to Izaak Walton. Following are a few of the 20 or so poems the National Book Award nominee wrote that refer to fish or fishing in one way or another. It’s obvious from the poems that Carver was a passionate angler. One assumes that during his troubled life fishing provided him with respite from the demons that rear up reveal their fangs throughout his prose and verse. This poem captures and celebrates the male camaraderie associated with fishing (and hunting), not to mention fishing (and hunting) camps. This sense of brotherhood or fraternity is often dismissed and belittled or ridiculed as male-bonding. I know men who hunt and fish, not to catch fish or kill animals, but to share kinship with other men in holy communion with nature. Such lofty thoughts would never occur to these men; if they did, it would embarrass the hell out of them. They are not the Iron Johns of whom Robert Bly spoke a quarter century ago. The poem is a male expression of a male communal or collective act. It’s an impulse of the clan, when men ventured out together to hunt and fish to feed the women, children and elderly. It was a right of passage — both ritual and ceremony — from childhood to manhood. The ability to bring home the meat (including fish) was celebrated. It was a mark of honour. It remains a form of masculine love. The poem pays homage to two very different men and very different writers, both of whom wade the two streams of Carver’s art — short story and poetry. Carver would know well the ‘ex-heavyweight’ Ernest Hemingway’s stories, especially the Nick Adams stories including Big Two-Hearted River. You can readily see the influence of the physician/poet William Carlos Williams in Carver’s poetry. to the edge of the riffle. I fished near shore with a quill bobber and a cane pole. under his lower lip. Mr. Lindgren didn’t drink. I liked him better than my dad for a time. all this, and fish with my own son. worked his tongue, like a thought, behind the bait. This poem might well be titled Fathers and Sons. It is one of Carver’s many memory poems, extending back to his sad childhood, with his difficult father and the spectre of alcohol that would control Carver’s life for many years and define much of his writing. It’s futile, but you can’t help wonder what kind of writer Carver would have been had alcohol not dominated so much of his life. It’s useless speculation to wonder whether he would have been more prolific or even more accomplished. Or was alcohol essential to shaping the enduring writer we remember and celebrate? Dream or not, this poem conveys a sense of nature up close and personal. It’s based on careful, concentrated observation; the result of a heightened awareness of the behaviour of fish, viewed sympathetically and attentively. 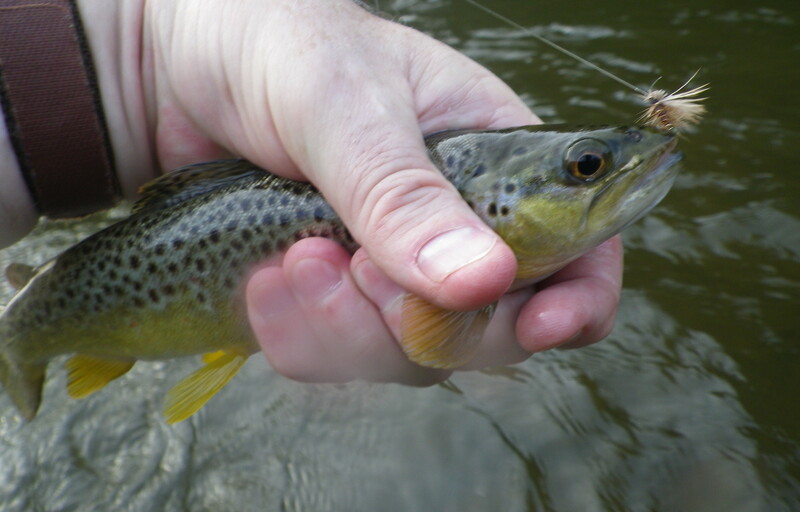 To hold a small brook, brown or speckled trout in the palm of your wet hand is to witness nature at its most fiercely and ferociously beautiful. American singer/songwriter Greg Brown, an avid fly angler, got it right when he wrote that brook trout are God’s reminder that creation is a good idea. I handle a maze of nylon. bedding my wife, bedding my wife. This poem is devastating. It starts mundanely, but moves inextricably to its train-wreck final two lines. 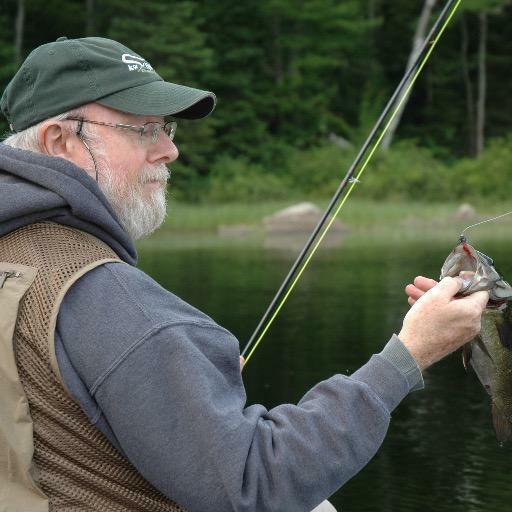 The poem is a reminder that solitude, one of angling’s greatest gifts, is not loneliness. I know of what Carver speaks. I was once in the exact same pair of waders. Fishing alone on an unknown river on my 59th birthday, eight months after my wife of nearly 20 years and I separated. She was in the arms of another man and, although my two sons were not ‘far away,’ I feared losing them more than anything I have ever feared. I believe with all my heart that fly fishing helped me survive that time of abject failure, aching loss and deep regret verging on despair. The line, ‘prowess is not to be confused with grace,’ is the best description of casting fur and feather on a fly rod I have ever read. For, at its finest, fly fishing is an act of grace to which all true anglers aspire. But the big streams have my heart too. And the places streams flow into rivers. The open mouths of rivers where they join the sea. in my mind like holy places. and watch these rivers for hours. Not one of them like any other. I’m 45 years old today. My heart empty and sere at 35! before it began to flow again. before leaving my place alongside this river. It pleases me, loving rivers. Loving everything that increases me. Where Water Comes Together with Other Water wades in the current of memorable birthday poems — I’m thinking of Dylan Thomas’ Poem on His Birthday or Thom Gunn’s For a Birthday. It also is a hymn of love, a prayer of love, a bardic ode to love not only for rivers but for what rivers symbolize — life from source to mouth to lake to sea. A river represents time, with its intimations of mutability and mortality. With this poem, Carver casts a lyrical line with all the other great writers of rivers — Thoreau, Twain, Maclean, Dillard, Haig-Brown, Hughes. With the exception of his love poems to his muse/poetic companion Tess Gallagher, Carver never wrote a poem more expansively joyous for the simple, yet profound, reason that he surrenders to the ‘holy places’ of rivers. It’s tears of happiness set to the music of language, the music of rivers. into a run. For Christ’s sake, man, hold on! This poem places the solitary act of fishing in a social context. But the fisherman fighting ‘a large salmon’ is at ‘the still point of a turning world,’ to quote T.S. Eliot. He is engaged in an essential act. When the poet beseeches the fisherman to ‘hold on’ we sense the stakes are higher — perhaps survival itself — than catching a mere fish. Echoes of Melville’s white whale in a less primitive setting. Happy to have these fish! the No. 14 Black Mosquito. the wind change the aspen trees. Another devastating poem that creeps up on you until the last two lines punch you in the solar plexus. Observing the ‘difference between a raindrop and a brook trout’ is an example of Carver at his poetic best. It initially strikes a reader as prosaic, but upon contemplation it becomes quietly visionary, reminiscent of when Blake sees a world in a grain of sand and heaven in a wildflower. This poignant poem marries Carver’s two great loves: Tess Gallagher and rivers. It is more complex than it initially appears. It begins by stating a fact that is obvious to those who fly fish — catching fish is wonderful but simply being out on the water is reward enough. The gratitude he expresses with respect to fishing is a minor key of the gratitude he expresses in a major key to Tess, a short number of years before the poet dies. The poem of thanksgiving is too hard-nosed to be maudlin and too nakedly honest to be bathetic. restlessly. Mystery enough in that, God knows. You ask if I have the time. I do. watch it come. Nothing to worry about. Just wind. No so strong. Though strong enough. And we hold on to the gunwales as it passes. our hull. The birds going crazy now. Boat rocking from side to side. This is a poem of friendship between close friends, fellow writers and avid outdoorsmen. Canadian writer David Carpenter has a photo on his website of Carver, Ford and another man with Carpenter posing during a duck hunt in Carpenter’s home province of Saskatchewan. The poem also chronicles the kind of strange — dare I say spooky — phenomena that hunters, anglers, canoeists, wilderness campers and hikers and mountain climbers sometimes experience in the intimacy of nature when senses are heightened. I was once fly fishing with my buddy Dan on a small headwater when a tornado hit the surrounding countryside. We were in the eye of the mayhem, so to speak, and had no idea of the devastation until we returned to the car and headed home. We spent a tranquil evening. At one point I shared a gentle riffle with a mother raccoon and her kittens who were enjoying a late supper. I waded, deepening, into the dark water. around my legs and held on. Parr darted one way, smolt another. Gravel turned under my boots as I edged out. Watched by the furious eyes of king salmon. I braced with the wind on my neck. as something touched my boot. Grew afraid at what I couldn’t see. the dark lip of the mountain range behind. I drew breath and cast anyway. Like the previous poem, this poem records a brief encounter with the strange happenings of nature. Few are the anglers and hunters who have not sensed at one time or another, even if fleetingly or momentarily, an eery, sinister sensation when deep in the embrace of dark nature. One of the chilly thrills of angling is negotiating that threshold between what we can see above the water and what we cannot see beneath the water — this sense is heightened as darkness falls on the water at the close of day. are starting into the river. To work or play, that is the question. Tis noble to be happy. There’s a little Tom Sawyer in all of us. There’s a little Huck Finn in all artists. Like all sport, to fish is to play; men playing a boy’s game. In a lecture he gave at Montana State University Library exploring whether fishing had meaning, Thomas McGuane referred to 20th century Dutch philosopher Johan Huizinga when he considered fly fishing in terms of fun. He asserted the recreational sport is neither ‘frivolous’ nor ‘superficial,’ but possesses ‘profound aesthetic qualities.’ Fun and play ‘ventilate our monotony,’ he said, quoting the philosopher. The first characteristic of fun is ‘freedom,’ which feeds ‘man’s imperishable need to live in beauty.’ Fly fishing is ‘rooted in the primeval soil of play,’ he concluded. I fished alone that languid autumn evening. Fished as darkness kept coming on. to the boat, and dipped a net under the fish. to be back once more, before I die. Far from everything, and far from myself. This is a poem marking the ‘dimming of the day,’ to quote English songwriter Richard Thompson. The ancient Celts referred to it as the gloaming, a time of twilight in the diurnal cycle when the borderline between this world and the ‘otherworld’ is thinnest. Death is stalking the poet. Fishing offers some brief solace, some brief respite; a sort of refuge, albeit temporary — a gift to the living that lends comfort as death approaches. This photo of a gorgeous nine-inch brown trout caught in the tailwater of the Grand River, between Elora and Fergus, in Southwestern Ontario, is dedicated to Raymond Carver. I had spent the day at the computer, working on a blog about Carver’s wonderful fishing poems. The day was lovely and I was inspired to hit my local water and cast fur and feather for a couple of hours at eventide. I have been fortunate to catch a few lovely fish — both brown trout and smallmouth bass — on the Grand, but I never had a camera with me. This is the first photo I snapped of a fish I caught. Although we had not communicated, my fly fishing buddy Dan Kennaley showed up at the river at almost exactly the same time as I did. Like me he had a couple of hours free that allowed him to slip away from family. We fished the same pool together before he ventured upstream while I headed home, eager to return to the poems of Raymond Carver.